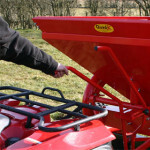 The Pro Spreader range of Quad-X sowers are ideal for spreading a variety of fertiliser and grass seed. These ground driven sowers have been designed with contractors in mind, for frequent use and are extremely durable thanks to a galvanised hopper as standard and plastic coated finish as optional. Durability is also aided by the stainless steel components along with the double sealed bearings. These sowers can be towed behind a quad or any vehicle with a 50mm tow ball. Fitted with flotation tyres they are ideal for sowing on soft ground or hard to reach areas when a tractor and sower are not suitable. With a wide wheel base they are very stable machines. Available in 465L, 7-bag capacity with optional extension sides available to increase the capacity to 680L/12bag. Please ask for more information regarding the painted/galvanised finish. Designed and Manufactured in Northern Ireland. The specially shaped spinner is equipped with stainless steel riser vanes which lift granules before spreading them, giving a higher trajectory on the exit of the spinner. The adjustable shutter settings can be set to suit required flow rates. Manufactured with stainless steel components to increase resistance to the corrosive nature of modern fertilisers. 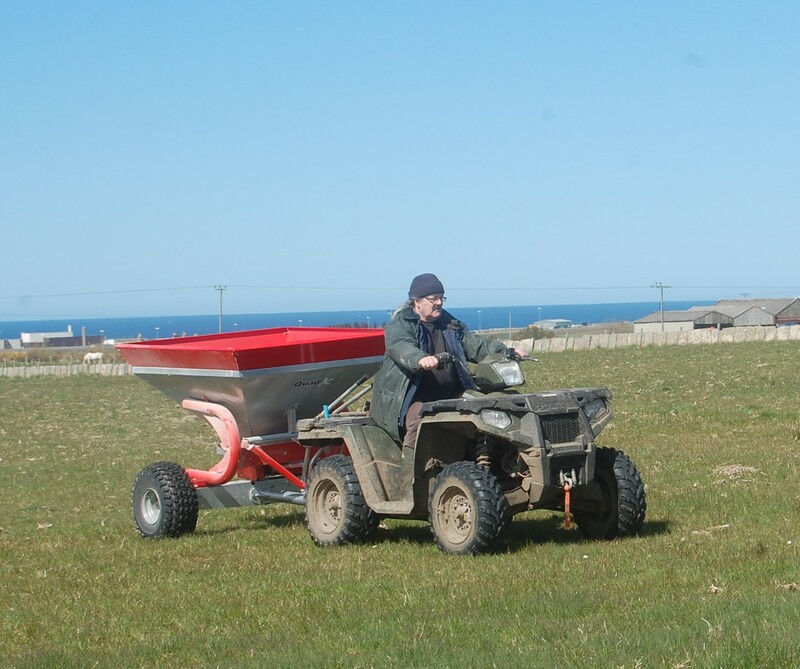 The Quad-X Pro Spreader Range has been designed with an extra wide axle for increased stability when full and if working on hilly ground. 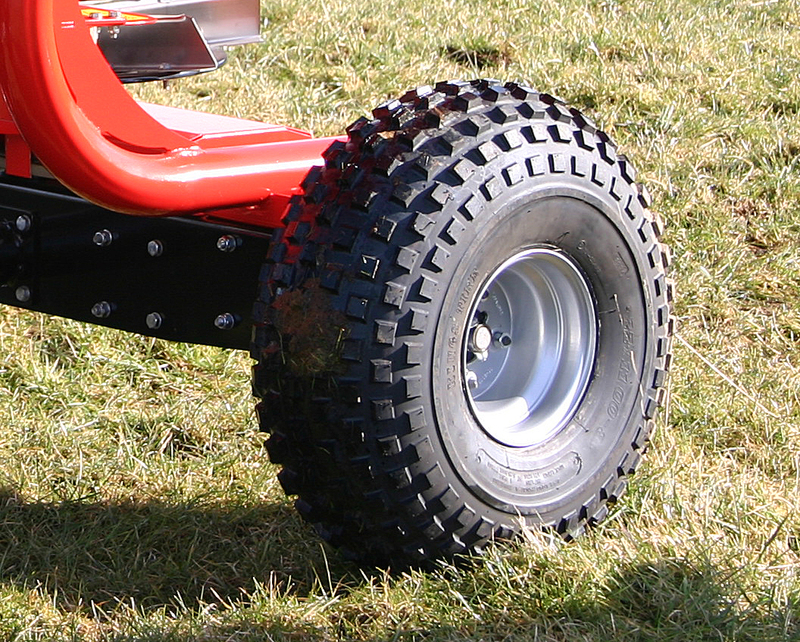 Also with extra wide axle allows a different track width from the quad so reduces the risk of marking the ground in wet conditions. The lever engagement enables the operator to engage and disengage the spinner from seated on the quad. 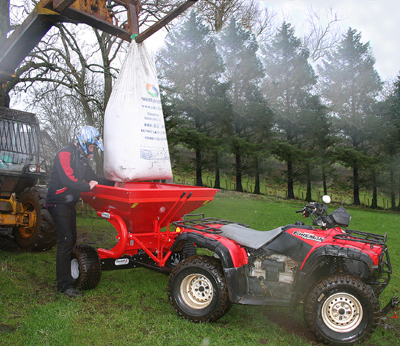 This fertiliser sower comes with the market’s leading spread width which can be adjusted to spread up to 14m, the stainless steel riser vanes lift the granules before spreading them, giving a higher trajectory on the exit of the spinner. The adjustable shutter settings can also be set to suit required flow rates. Fitted with flotation tyres they are ideal for sowing on soft ground or hard to reach areas when a tractor and sower are not suitable. With a wide wheel base they are very stable machines. Flotation Tyres for wet or soft ground! This fertiliser sower is 465L however if you work with big fertiliser bags you can opt for the extension sides to increase your sowers capacity to 680L.